Are you looking for a professional WordPress trainer? Rachel Case is a professional trainer who specialises in WordPress training at all levels. She has trained over 15,000 people and is very experienced at tailoring her training to the needs of the audience. Her training can be tailored for complete beginners or advanced users. She provides WordPress training on a 1-2-1 individual basis and for groups. You can choose the length of each training session which ranges from a couple of hours to a full day. 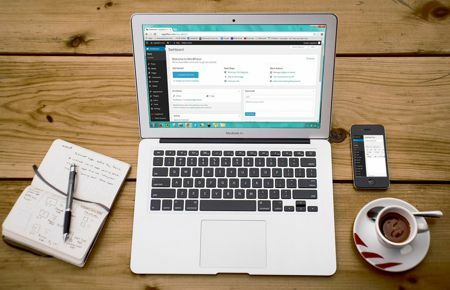 Many of our clients are already using WordPress but need some tuition to learn more to use it more effectively. Rachel can also advise on security measures, backups and other important tasks which are often over-looked. We cover a wide area of South Wales including Cardiff, Barry, Penarth, Cowbridge, Bridgend, Swansea, Neath, Merthyr Tydfil and Pontypridd. Training can take place at your premises or a convenient location. This popular seminar is aimed at anyone who is new to WordPress and wants to build their own website. You do not need any specific computer skills other than being comfortable using a computer. Topics include installation, features, adding and editing content, plugins, themes, security, SEO, social media etc. All you need to bring is a laptop. If you need to hire a laptop please ask us. Places are strictly limited so that all attendees have plenty of opportunity to ask questions and get the most from the day. This one day seminar is aimed at anyone who already has a WordPress website and is ready to learn more. Topics covered include plugins, how to edit theme code, back ups, security and an introduction to features such as ecommerce. Attendees will be shown how to edit css code so a confidence with computers is required for this seminar.